University of California San Diego condensed matter physicists noticed something surprising about electrons—they behave like a family. Electrons not only carry electric charge as exhibited in electric currents, but they also possess spins which are responsible for quantum magnetic properties. 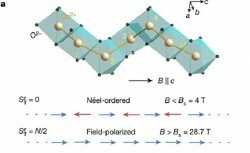 Electron spins can organize, bond and interact. When excited, one spiraling part impacts the others. This dynamic spin was the subject of breakthrough research by UC San Diego Professor Congjun Wu, physics graduate student Wang Yang, former postdoctoral scholar Jianda Wu, their colleagues at the University of Augsburg in Germany and other collaborators. Combining experimental electron spin resonance (ESR) measurements with analytical and numerical theory—along with good old-fashioned brain power and writing materials—the collaborative researchers showed for the first time that string states dominate quantum spin dynamics. These findings impact the study of quantum magnetism in condensed matter physics—a field that examines the organizing principles of quantum states of matter, particularly emergent behaviors of trillions of electrons (as in superconductivity and magnetism). The study is explained in a paper titled “Experimental observation of Bethe strings,” published in a recent edition of Nature. With ESR, a method that uses terahertz lights or microwaves to excite and measure spin dynamics, the researchers discovered a series of associated spectral lines—a type of “fingerprint” identification, explained by quantum mechanics and with quantum numbers—first hypothesized by Nobel Laureate Hans Bethe in the 1930s. In strongly correlated quantum spin systems, a single spin’s flip excites its neighbors, who follow suit with these “excitations,” known scientifically as “magnons.” Bethe first proposed that two magnons could bind to form a “string state.” How to observe these exotic states, however, has challenged scientists for decades. “Our experimental collaborators measured the spin excitation spectra and discovered a series of characteristic spectra lines,” said Wu. “Our UC San Diego group theoretically identified them as evidence of Bethe’s string state excitations.” Experimentally this represents the first time scientists have observed the string excitations. Wu said for strongly correlated quantum problems, if there were no good strategy, the complexity of computation is so huge that no modern computer could do the job. “Fortunately, the system we studied can be described by integrable models. Our brains, assisted by pencil and paper, are the best equipment rather than computers,” stated Wu, adding that this study will aid the communication between condensed matter and high energy physics communities. The UC San Diego physicists acknowledge A. Loidl, the experiment leader at University of Augsburg; Jianda Wu, now at the Max Planck Institute for the Physics of Complex Systems in Dresden, Germany; and Shenglong Xu, Congjun Wu’s former student, now a postdoctoral scholar at the University of Maryland. The Department of Physics, along with the chemistry and biochemistry and the mathematics departments at UC San Diego, is part of the Division of Physical Sciences. All three departments are ranked in the top 20 for their doctoral programs, according to U.S. News and World Report.